Nigeria’s president and ruling party were on Saturday accused of dirty tricks to stifle opposition support, with one week to go before the election in Africa’s most populous nation. The main opposition Peoples Democratic Party (PDP) had been due to hold a “mega-rally” in Abuja, but said it was shut out of the venue despite having made payments and obtained official approval. It blamed President Muhammadu Buhari and his All Progressives Congress (APC) and called the move “provocative” and a sign of “desperation”. APC spokesman Lanre Isa-Onilu told AFP the party did not own the venue, “so there is no way we could have denied them access to a place we don’t own and we don’t have control over”. A record of just over 84 million voters are registered this year — up 18 percent from 2015, when Buhari became the first opposition candidate in Nigerian history to defeat a sitting president. Buhari secured just under 54 percent of the vote, beating the PDP’s Goodluck Jonathan by 2.6 million votes. The APC is bullish about Buhari’s chances of re-election. But many predict a tighter race because of dissatisfaction at insecurity, claims of a one-sided fight against corruption and the oil-dependent economy’s recovery from recession. “People are tired after four years of Buhari and even if he’s the incumbent, the outcome of the elections is very uncertain,” said Cheta Nwanze, of analysts SBM Intelligence. 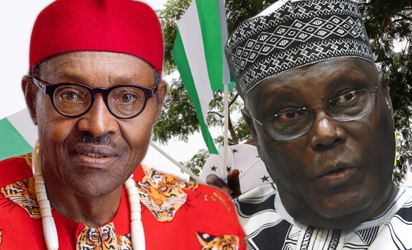 Two key factors in political allegiance — ethnicity and religion — have been removed, as both Buhari and Abubakar are Hausa-speaking Muslims of the Fulani ethnicity. “Buhari is positioning himself as a statist, pro-big government, where government should own most things, while Abubakar on the other side is positioning himself as pro-business, pro-private enterprise,” said Nwanze. Veteran politician Tanko Yakasai said the focus on policy and programmes could be a “good beginning for Nigerian politics”, as younger, more ideologically driven politicians emerge. A second round of polling takes place on March 2 to elect new governors in 29 states, and new members of state assemblies. But the chairman of the Independent National Electoral Commission (INEC), Mahmood Yakubu, has said he sees “no reason” to postpone. “We are good to go,” he told Channels television on February 6. Buhari has also faced claims of executive interference in the judiciary after he suspended Nigeria’s top judge, who has been accused of breaching asset declaration rules. The chief justice is the head of the Supreme Court that would hear any legal challenges to the result. Former military ruler Buhari challenged the results in 2007 and 2011 — and lost. In 2015, international interest in Nigeria’s election was high given the threat from Boko Haram and its kidnap of more than 200 schoolgirls from the Borno town of Chibok. It was also noteworthy for Jonathan’s willingness to accept defeat and a peaceful transition, which sparked hopes it could set a precedent across Africa. But wider global interest has been comparatively muted this year, not least because of a more domestic-focused US administration and Britain’s impending exit from the European Union.